Walking Diplomat: Bev is Blogging The Caine, Sometimes all it takes is a Whisper. Bev is Blogging The Caine, Sometimes all it takes is a Whisper. (source: FACEBOOK PHOTO AND NEWBOOKS NIGERIA) “The Whispering Trees” is a story that carries so much weight in words that you don’t even have to know who the author is. That story where at the end, it doesn’t feel like a story but like a passage in your own time. You go back to that quotable quote and you return to that character that dared manifest itself as your mirror image. 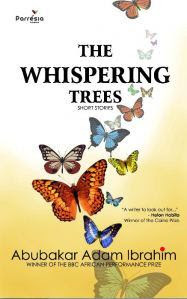 “The Whispering Trees” is a summary of all our lives. It does not coerce you to believe in a particular faith but allows you to step by step be part of the human experiences, not just the shell of the characters but a part of their existence, their purpose. The opening paragraph is so vivid and will make you sit up to follow what happens. “It’s strange how things are on the other side of death. I fear I am incapable of describing the experience to you because I do not know what word to use. One simply has to die to understand the enigma of death.” This paragraph above is the perfect ingredient for powerful story-telling. It appears effortless with the use of simple words to explain such profundity. “The Whispering Trees” is like a parable. It uses death to symbolize eternal life, it uses mortals who become immortal in order to serve humanity better and it uses the different types of love, Platonic love, Agape love and Eros to unite all the things that should matter in life. In summary, Salim finds himself in a realm between Heaven and Hell after a car crash which killed his mother Ummi. In that state, he is able to reconnect with Faulata, his love. Blinded from the crash, Faulata’s love and strength bring him back to phyical recovery. Salim is infuriated by his new station in life and reciprocates by being physically and mentally abusive to the patient and endearing Faulata. He is also impossible to live with and his siblings and neighbours bear the brunt of that. When he finally accepts his physical state, Faulata quits her martyrdom and runs to the hands of another man. Once again, Salim retreats into the darkness until he finds a place of reconciliation with The Whispering Trees, the woods that speak deep into his soul and into the souls of past dead friends. The trees offer the pivotal point of the story and enable the readers to also reconcile with their own past before they can move ahead to a better future. In the story, the metaphysical state is part of our own consciousness and the dialogues reflect our thought processes as readers and expose our deepest needs. The author blends the mortal and immortal experiences so well. From the start, the smell of the awful antiseptic jolts him from his surreal presence back to earth. He hears the melodic voice of Faulata before he is brought back to the car with Ummi his mother and the stark truth of the law enforcement officers who frisked his body after the accident leaving him for dead. This blend of the two worlds through such simple incidents is one of the many reasons that make the story an authority on life. The dialogue below between the Corporal and officers who rob Salim focus on the central theme of hypocrisy and corruption which the story expertly depicts. “…Oga see. This one too don die.” It was as if removing my money from my body had settled the little matter of my being alive.”… “…How much you find for ‘im body?” The first man said, “Four thousand naira, Sir.” “…Oya, put ‘im body with the others but hide the body with the others but hide the money before people come.” A third one said, “God O! This accident is bad, eh! See how everybody just die. Chei!” The oga replied angrily, “Shut up Corporal. If them no die you got fit get this kind of money wey you dey get just like that? Na this kind thing we dey pray for, no be say na we kill them.” After this episode of the tragic car accident that claims Ummi’s life, we feel the full impact of the accident on Salim. He has two fractures and three broken ribs but real damage is to his eyes leading to blindness. This is when Faulata’s friendship and love are put to the test. Faulata represents our own earthly pleasures and needs. She is patient throughout his predicament, nursing him, bathing him, encouraging him to attend the school for the blind and live his life fully. She even readily attempts to burn the house of the unscrupulous Saratu, the beguiling friend to Salim’s younger sister Jamila after her endless taunts at Salim’s accidents due to his blindness. ‘Saint’ Faulata is an avid protector of Salim’s dignity. It is here that we realize again how foolish our emotions are compared to the bigger picture. It is Salim’s anger that makes him march towards Saratu, leading to the subsequent stumbling over buckets. He is enraged at the taunts from a young girl. This is the real blindness that the story wants us to relate with, the blindness in our nature that makes us unforgiving and constantly irate. Faulata, a representation of our earthly pleasures, lashes so strongly at Saratu’s relatives when the real person she is upset with is Salim, the initial cause of this predicament. Her saintliness is also called to question and there is a deep silence that engulfs after the incident. Faulata, a representation of our earthly needs, lashes so strongly at Saratu’s relatives when the real person she is upset with is Salim, the initial cause of this predicament. He begins to question every possible cause for his blindness from the Government, the driver, his sister, all but The Almighty. It is not until Faulata introduces the idea of applying to the school of the blind that he lashes out at God and their argument reaches an all time high and she makes her first exit. Just as our earthly needs do not satisfy us, Faulata could not fulfill the real spiritual need that Salim sought. After her departure, The Whispering Trees, the voices that speak to the souls of the characters, enter the story through a flashback of Salim’s childhood. The trees are part of the woods where he and his friends played and created their lifelong memories. It is also the place where Hamza, one of his friends, died in a pond that was really too shallow for anyone to drown in. The incident resulting in rumors of a spirit, which in effect led people to stay away from the woods. Hamza could easily symbolize Jesus who in certain faiths is believed to have died for mankind. After Hamza’s death, people stayed away from the woods and the woodland creatures and animals were able to live in harmony and the flora and fauna in peaceful co-existence. They thrived without the tampering of human nature. Jesus likewise had to die for the removal of mankind’s sins. After Salim agrees to go to the school of the blind, Faulata has to go to prepare for her University studies. Despite this he is able to gain strength in the new revelation from the memories of the woods and his ‘second chance’ at life. He becomes more accustomed to his blindness and is very pleasant to his classmates and professors, enjoying the outdoors and relishing in the gift of a new beginning. His newfound happiness and strength are really a depiction of his spiritual life. At this point, Faulata appears less and less before announcing her upcoming marriage to another man. Once again, Salim falls into despair and we are able to see how frail we are as humans, and how limiting our saintliness is in the face of a much bigger picture. He implores death to take him and his relatives bring a healer to anoint him with oil and cast out evil spirits. After three days when he comes round, Salim is able to see into the spirits of humans and understand their plight and life’s greater purpose. The three days before his reappearance is also like Jesus who rose after three days in the grave. With his new spiritual lenses, Salim is also able to notice the trees screaming in agony when they are felled, he notices hues around peoples’ hearts, each representing an actual human condition. After a nightmare where the whispering trees caution him about seeing with his spiritual eyes, Salim enters into the real purpose of his life. On meeting Hamza who died in those very woods twelve years ago, he is able to reconcile with Hamza’s mother and bridge the gap between her loneliness and the comfort that her son is in a better place, which could have been Heaven. Hamza is the sacrificial lamb in this instance. The one who is able to forgive Tanimu, the young boy whose actions led to Hamza’s physical death. Forgiveness is one of the ultimate lessons in this story. “The Whispering Trees” can be explored through the eyes of an artist, an anthropologist, a philosopher and a realist. One review is certainly not enough and I look forward to hearing more from other readers like Harriet Anena below, Ugandan writer and social critic. The words in Whispering Trees guide you to a seat and ask you to listen – to a message not so new but so deep and real you wouldn’t want to object. 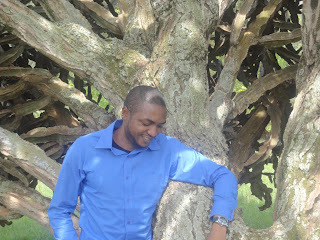 The writer raises critical cross-societal issues that I have read about and, some experienced, – corruption [of police officers who rob corpses], stigmatisation [of blind Salim when he goes blind], and the survival of genuine relationships [of Salim’s sister and friend Hamza] amidst intruding hypocrisy. The only difference is that Ibrahim has a fearless grasp of words and almost mercilessly uses them to his advantage. The aggressive use of imagery, especially in the robbery scene, and the use of the First Person narrative, makes the characters visible and issues raised, believable. For instance, in his blind state, the main character - Salim appears more alive visually, than the people around him. Harriet Anena As a reviewer, my only misgiving is the very last quote in the story; Happiness lies not in getting what you want but in wanting what you have. This is unbefitting for such an important story that stands on its own merit without the use of such quotes. Reviewed by Beverley Nambozo Nsengiyunva The Whispering Trees was written by Abubakar Adam Ibrahim and shortlisted for the 2013 Caine prize.